It's no wonder the women we see here feel so welcome and comfortable. They know they are our top priority. 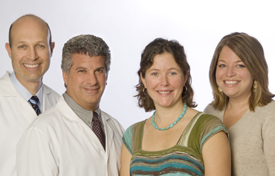 Our warm, personalized approach and multi-specialty expertise assures you that you are in good hands. And for our OB patients, knowing your baby will be delivered at Beverly Hospital offers confidence and peace of mind. You will have access to a Level II Special Care Nursery staffed by top physicians from Boston Children's Hospital, round-the-clock anesthesia coverage, nurses with special C-PAP airway training for respiratory troubles, and the full resource of other services. Smaller and more private than a community health center, our team offers an environment where women feel genuinely cared for. We treat women like family with care and respect. We offer same day appointments for urgent issues. Referrals are handled through our Central Referrals Office. Northeast Hospital Corporation, as a leader in healthcare innovation and excellence, consistently applies performance improvement to its family-centered healthcare environment. The Board, Medical Staff and Employees achieve this goal by continually improving quality, efficiency and cost effectiveness, while maintaining both respect and compassion for our patients. Northeast Hospital Corporation is committed to providing the highest quality of care to all individuals who can benefit from our continuum of care. Our concept of care broadly embraces the health, wellbeing and dignity of the patients we serve. For over a century, the Hospitals of Northeast Hospital Corporation have provided healthcare services to their communities, working to identify the needs of the community and devoting the necessary resources to meeting those needs. Our goal is to reach out to and be a reflection of the diverse populations we serve and to assist each community member in achieving their highest level of health, regardless of race, color, creed, national origin, disability, age, or ability to pay. For your convenience, our patients may be seen Saturdays for same day sick visits at Lahey Outpatient Center, Danvers (formerly Beverly Hospital at Danvers) 480 Maple Street. A same day sick visit can be scheduled by calling 978.304.8354 on Saturdays between the hours of 8 a.m. to 12 p.m. Please note this is for Saturday appointments only. Prior to your first appointment with us, please print this patient profile and registration, complete it and bring it with you to your next appointment. Please complete the form whenever there is a change to your personal and/or insurance information and bring it with you to your next appointment. Our practice offers comprehensive care from certified family planning to prenatal massages every Friday; from obstetrics and midwifery to full gynecological services. In addition we offer on-site ultrasound testing, lab services and non-stress tests. Free, confidential pregnancy testing is available on a walk-in basis. Caseworkers are fluent in Spanish and the Khmer dialect; interpreter services are available upon request. We accept most major insurance plans. To ensure coverage, please provide insurance information when you call.